Run of the mill tale of young love, hopes and dreams, elevated by being based around what was billed as a cultural milestone – The Stone Roses live on Spike Island in 1990. The plot is quite basic. Young lads from Manchester caught up the Madchester scene looking to carve their own groove with their band Shadowcaster. The film documents the sixty hours leading up to the gig of the generation on Spike Island with the Stone Roses, their plots to blag their way in and their hope of getting their demo tape into the hands of the Stone Roses. What lifts the film, form the Peppermint Iguana point of view, is the fact that it focuses on the Roses. Many bands claim to be the greatest of their generation, but the Stone Roses were. Fact. Oasis, Happy Mondays, PAH! Not fit to tie the laces of the Roses. The Roses don’t actually feature in the film but they are constantly in the background, either being talked about or just in the soundtrack. And Shadowcaster most definitely have got the Roses vibe down to a tee. We won’t spoil the film and tell you whether or not they actually get into the gig (or whether he gets the girl) , but clearly the script writer was either there, or has heard the score from people who were there. Cos basically, whilst the event was amazing on paper, the sound was all over the shop just hit you in waves, depending on which way the wind was blowing down the Mersey. The reality was that the gig itself was a massive anti-climax after all the build-up. But hey, as they say at the end of the film, “it aint where you are, it’s where you’re at”. 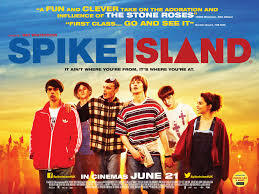 And Spike Island was the place to be at.